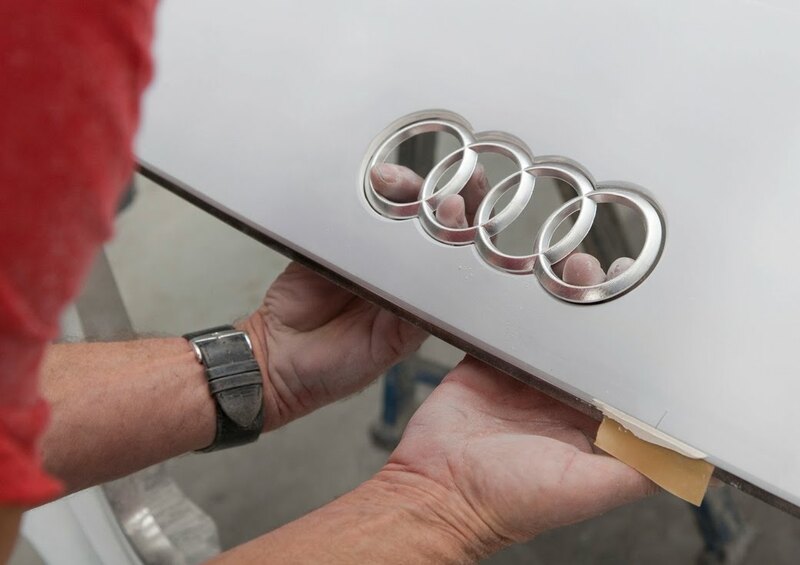 Audi has just released a very interesting report and series of photos documenting the creation of the Audi e-tron Spyder. From the first sketch to the concept's debut appearance at the 2010 Paris Motor Show, every step is meticulously covered. Check out the story and behind-the-scenes photos direct from Audi after the jump. It is a functional, rectangular building with a gray facade – a hall like thousands of others in the industrial parks dotting our cities. The only sign of any significant activity is a lone Bavarian flag fluttering on a wooden balcony that seems a bit out of place. This seeming wasteland is in reality a place where the future of the automobile is quite literally being made. Things are much livelier inside the hall. Two designers and four modelers are working on a large block of brown industrial plasticine. The result of their handiwork is pioneering for the design of one of Germany’s most successful carmakers. 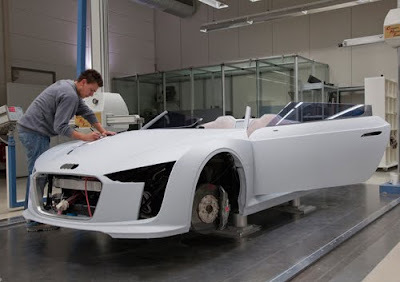 This is where the Audi e-tron Spyder, the latest show car from AUDI AG, is being created. The faces are drawn with tension at this decisive moment. The modelers and designers are going through the data on screen together one more time. There is no time for lengthy consideration and discussions. Then the decisive click on the “Confirm” button. The mill mounted on two giant arms goes into motion. Fed with the vehicle data, the mill begins carving the designers’ design out of the clay. For the next 18 hours, one layer after another is cut away until the first side of the car stretched over a frame of steel, wood and rigid foam stands on the floor of the hall in three dimensions and in full size. Three months before the start of the show, Lamberty and his team are working time-intensively on the clay model in the hall. That they are concentrating on the design of a show car is already a success in itself. 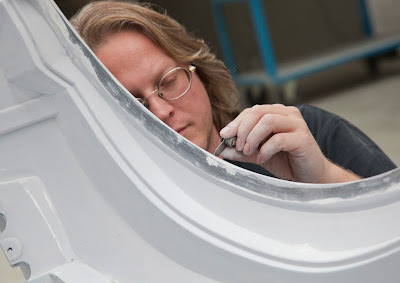 To design a show car is the dream of many automobile designers and thus a coveted job. “The beauty of a show car is that the initial ideas are often implemented almost unchanged. 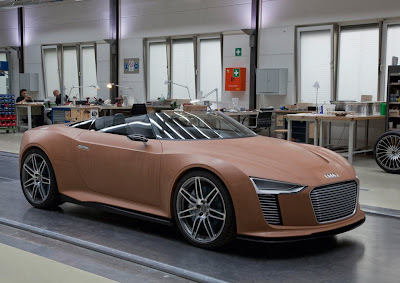 We are largely free of technical constraints,” says Wolfram Luchner, a designer at Audi who played a major role in the creation of the exterior of the Audi e-tron Spyder. A multi-staged internal competition decided who got to design the car. 17 designers entered the competition. “The ideas developed were bold and free of constraints. Some of them were even radical. 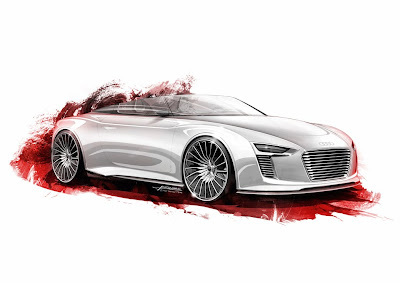 The broad scope of the designs shows the great potential of our designers,” says Stefan Sielaff, Head of Audi Design. He initially chose four teams, who then had two weeks to flesh out their “directions,” or initial designs. In the next step, two designers built their designs as 3D data models. For the final choice between the last two designs, the teams projected their computer data on the big screens in the design studio. What just a few weeks ago were the initial strokes on paper was now displayed on the walls as a three-dimensionally tangible show car. A lot is at stake with the final decision. 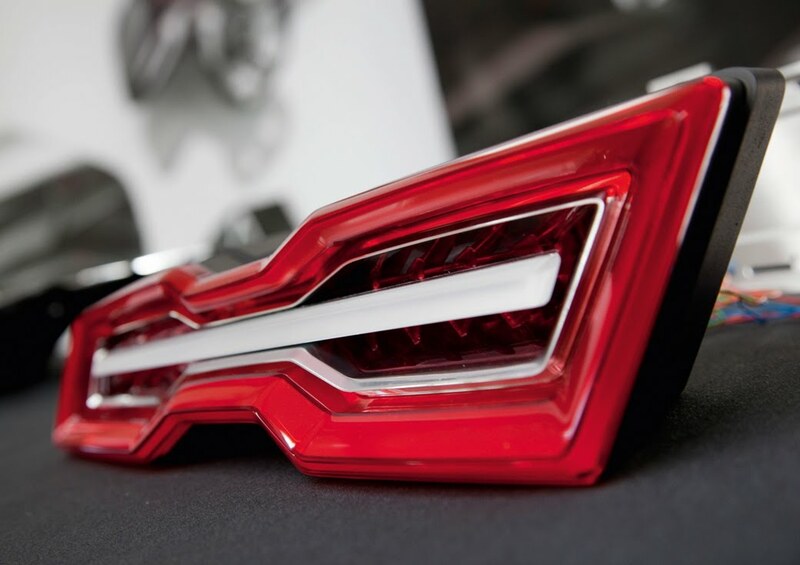 After all, the chosen design will be catching the eye of thousands of international visitors at the show in Paris. A second portrayal method viewed under daylight helps to properly evaluate the colors and shapes. The designers build full-size silhouettes of their proposals and position these on a race track. The winning proposal is then chosen in daylight at a distance of approximately 100 meters – a radical and simultaneously emotion-packed design. An open sports car with a distinctive, prominently arched windshield that, like the visor of a helmet, describes speed in its purest form. Cut off from the outside world, designers and technicians are now working together inside the hall, which is secured by an alarm system. Technical Development in Ingolstadt had initially developed the undercarriage of the Audi e-tron Spyder separately. The two teams are now working together on site on the clay model. They measure, discuss and talk about even slightly misaligned contours. Just a few centimeters can mean that the required hardware will no longer fit in the show car. The engineers define the most important structural design data during the first design phase. 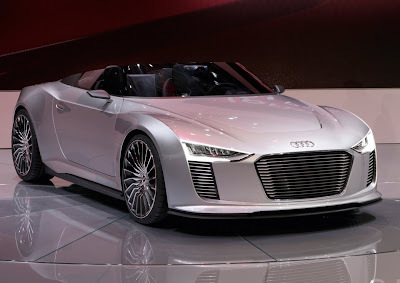 The exterior of the Audi e-tron Spyder has roughly 10 so-called hard points – specifications that the designer is not allowed to alter. Everything else is up for negotiation. And because design does not always follow the rules of technical feasibility, these negotiations are not always easy. 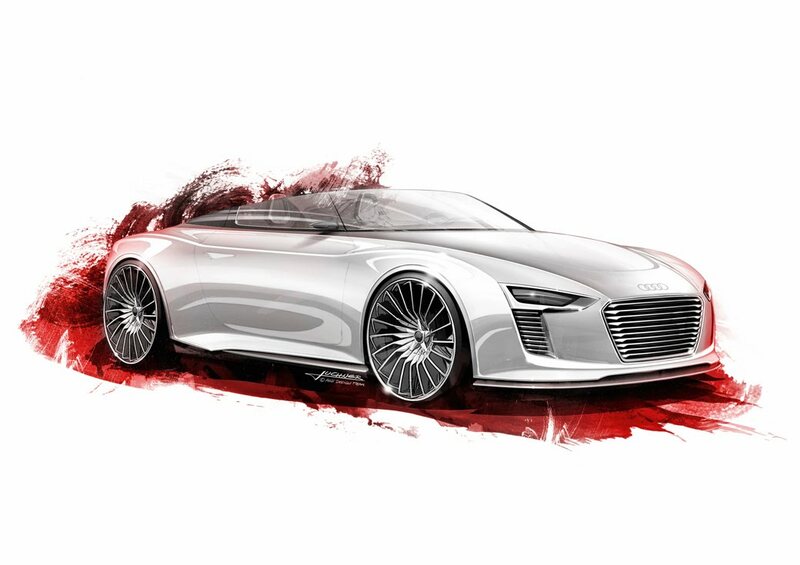 “The design freedom is what makes a show car so appealing,” says Luchner. “I always have the original design in my head. My objective is to implement this design with as few changes as possible.” The technicians, on the other hand, sometimes have to reign in the creativity of the designers. Although largely made from parts that only exist for this vehicle, the show car must still meet all of the technical requirements. It must be safe and drive in such a way that it can also be used by journalists for filming and photo shoots. While four modelers apply the finishing touches to the door handles with knives, scrapers and planes, the designers and engineers have turned their attention to a wheel. Delicate struts of aluminum and carbon are reminiscent of a turbine; the delicacy of the material more of a fine piece of jewelry. Designers and technicians agree that here they together have succeeded in turning what initially seemed to be an impossible idea into reality. This could not have been done in a production model. Whereas the wheels of previous show cars comprised four to five pieces, the wheels of the Audi e-tron Spyder are made up of 66 individual parts. Six weeks before the show, the two halves of the model have been combined to yield a painted whole. The modelers’ work has paid off. At first glance the modeled clay looks no different than a functional automobile. Even the headlights and door handles have been carved out down to the last detail. Everything has to be just right, because the model serves as the basis for what is known as the design freeze. This is the first major milestone for the designers, a sort of advance premiere of the show car, with the excitement to match at the presentation. The Audi Board of Management makes the final form-finding decision, and the starting gun finally sounds: Construction of the final show car can begin. The outer skin of the show car is made of carbon fiber. 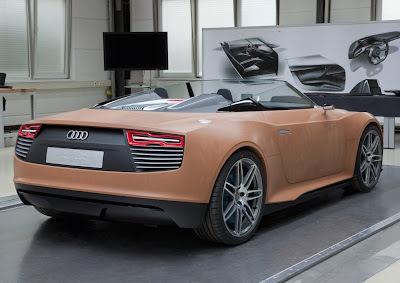 Because the material can still be modified considerably more easily than steel or aluminum even at a late point in the process, it is ideal for the Audi e-tron Spyder, which must be created in a short period of time. The employees first mill the individual body parts as negative molds from a block of rigid foam. They then apply the carbon fiber fabric, let it harden, trim it, grind it and prime it. Everyone working here is aware of the importance of precision. They are making a one-of-a-kind vehicle. And not just the final show car is one-of-a-kind. Because there is only one of every component of this vehicle, replacing components in Paris is out of the question. The time pressure is enormous. The date of the show in Paris is steadily approaching. The show car is still just a collection of individual parts waiting to be assembled. 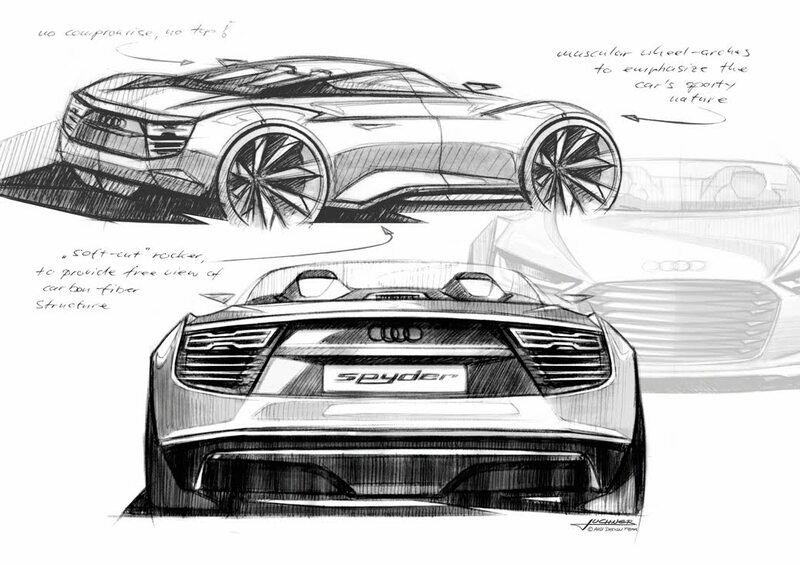 It is hard to believe that the Audi e-tron Spyder will soon make its big appearance. As many as ten employees at the same time work on the showpiece during the final weeks and at least as many again are involved in the background work. They are all experts for their respective components and know precisely what they have to do. In the end they join the pieces together with a precision down to the millimeter. The body is then crowned in silver in the paint shop. The Audi e-tron Spyder shines at the Paris Motor Show, as do the employees. They have done it. The idea of a hybrid-powered roadster has become a reality. It is on display in Paris: compact, elegant and open to the heavens.